A chopped salad can be made from a variety of bite sized vegetables of your choice. It may or may not contain any lettuce. You can add small pieces of meat if you like to make it a delicious low calorie meal. These salads are like a smorgasbord on one plate. 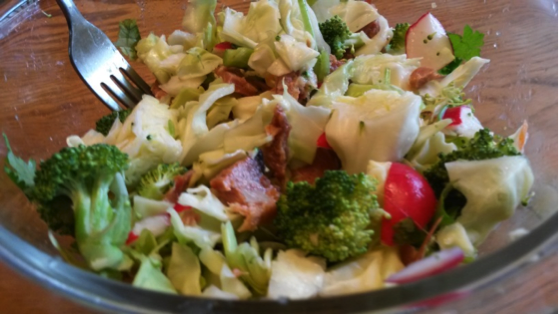 I love these cool salads as an alternative to a lettuce salad during the hot days of summer. I’ve never made two chopped salads that are the same. You can be as creative as you like with them. I’ve listed the ingredients that are in the picture, however you could add or substitute endive hearts, romaine hearts, corn, peppers, zucchini, yellow squash, etc.